Purchasing blankets of the highest quality your budget will allow is a choice you'll never regret making. Poorly made blankets are more likely to pill and need to be replaced more often. Whether you prefer the breath-ability of 100% cotton blankets, the warmth of wool or the durability of synthetics, investing in the best made piece is the priority. Available in an array of neutral colors, this reversible design features a cozy microplush fleece front and a faux fur reversible back. This ultra soft blanket is perfect to snuggle on the couch, throw over the foot of a bed accenting any home décor, or sending as the Perfect Gift. EASY CARE: Machine wash cold, tumble dry on low heat. Avoid direct heat. Do not use bleach. Do Not Iron. Heat treated for locked in color and will not fade. Made with shrink-resistant fabric. The digital images we display have the most accurate color possible. However, due to differences in computer monitors, we cannot be responsible for variations in color between the actual product and your screen. Get Wrapped Up in The Word with our superior-quality fleece/sherpa blanket that is as indulgent as it is beautiful. Only the finest material provides a sumptuous combination of style and comfort, and the smooth yet furry texture beautifully emulates the inherent softness. Send as the Perfect Gift for someone celebrating life. Your gift will invite them to snuggle up on the couch or chair and renew their faith. Also perfect for throwing over the foot of a bed to upgrade any home décor. A Blanket Blessing card is sent separately and offers more of God's promise for you to soak in and relish while you or your loved one basks in the goodness and glory of life. Receive our Weekly Word at Living Scripture Strong. Details you'll appreciate....Crafted of durable, easy-care polyester. 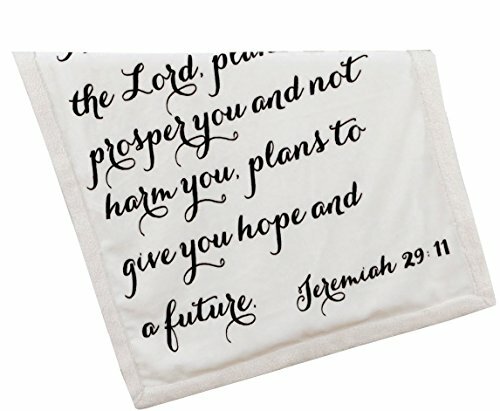 Plush fleece with the inscription of God's promise reverses to sherpa pile that is as soft and fluffy as lamb's wool. If you have any questions about this product by Scripture Strong, contact us by completing and submitting the form below. If you are looking for a specif part number, please include it with your message.